EDITOR'S NOTE: The following is an excerpt from The Chasm by Randy Alcorn (Multnomah). For most of a day, I’d been climbing a sharp incline of rocks and shale, for an outcropped ledge that would afford a better view than anywhere else in this strange land. Finally, scrambling up the last twenty feet, I stepped out on that ledge and looked. What I saw took my breath away. There it lay, stretched out against the horizon as far as I could see—the thing I’d been warned about, the thing I’d been told was ultimately unavoidable. The sight of it was even more devastating than I’d feared. Here I was, hoping to travel to the distant shining city, a world of wonders I absolutely had to reach. For my first thirty years, I’d never dreamed such a place even existed. Then when I started to believe it might, I tried like the devil to avoid thinking about it, for reasons I still don’t understand. And now here I stood, all hopes of reaching that magical place dashed. Before me lay the biggest obstacle imaginable. No, it was absolutely unimaginable. That great yawning chasm took my breath away. An abyss of staggering proportions. I had once stood with my family, when I had one, gazing down into the Grand Canyon. I’d been swept away by its grandeur for a few minutes before needing to pack up the kids, grab a hamburger, and get them to the hotel. But this endless rift, this hole in the universe, made the Grand Canyon appear in comparison as the grave I dug when ten years old, to bury my old dog Ranger. It seemed infinitely large, deep and foreboding, containing not a shred of beauty. It stripped my heart of hope. For clearly the Chasm meant that the city calling to me from the great beyond, if it were real at all, lay forever out of reach. All that mattered for me was the place I could still glimpse on the horizon, far beyond the impassible barrier spread out below me. I had to get there—I had to reach that stunning capital of a great undiscovered country, that shining city that rested on the great white mountain. The place named Charis. My name is Nick Seagrave. My story is true, though what world it happened in is hard for me to say. The memories burn in my brain, more real and weighty than what we call the real world. Before I tell you the incredible events that unfolded next, what happened to me at that chasm, I must first take you back to explain what led up to the moments I have just described. Only then can you understand me and my story, and perhaps unfold its meaning. I remember like it was yesterday that moment when I caught my first glimpse of Charis, glimmering in the distance. Initially I thought the remote city seemed cold, even oppressive. Our band of travelers that day had rounded a bend shaded by rock towers, and there it was, off to the west, rising high on a ridge. Silently, we all stared at it. From where we stood, all we could see between us and the mountain crowned by Charis were rolling green hills scrawled with various pathways, including a ribbon of red. This was the “red road” I’d first learned of in some ancient inscriptions in a cave I’d entered one evening to escape a pounding rain and crashing thunderstorm—and something far worse. But that’s another story, to tell another time. As my traveling companions and I continued absorbing our first glimpse of the faraway city on the summit, it took only a moment for my heightened vision to pierce its walls. How did this happen? I can’t explain it, but I was as certain of my perception as I could be. My intuition told me that the light was but a ruse, that inside the city all was dank and shadowy. And enthroned there sat a dreadful, intolerant tyrant, squashing creativity and initiative, enslaving any subjects foolish enough to have entered the city. I envisioned him granting his slaves freedom enough to make a mistake just so he could condemn them for it and command their execution. I’d long ago learned to trust my instincts, which had helped make me such a successful businessman and entrepreneur. And those prized instincts assured me this city was a monument to the pride of some self-proclaimed, glory-hungry sovereign who delighted in robbing men of their dignity. A strangely confident assessment for one who knew so little. But if I lacked something in those days, it was not confidence. Light? What about the shadows I felt certain lie within? How could that old geezer be fool enough to trust that light on the outside meant light within? I heard nothing. Who was she trying to trick, and why? With enchanting fervor Malaiki exclaimed, “Songs of life and learning, choruses of pleasure and adventure! In a thousand languages!” She broke into dancing, soon joined by some of the others. Were they trying to make fools of themselves? The uncomfortable thought struck me that perhaps I envied them, wishing I had a reason to dance. I quickly pushed the thought away. Even as they twirled and high-stepped, they kept looking toward the city. Following their gaze, I found my perception changing, despite my resistance. The coldness of the place was gradually replaced by light and warmth and by what seemed to be the radiant energy of people there celebrating. The city began to shimmer on the horizon, touched by sparkling blues and greens and golds that blended with the sky and sunlight, pulsing in and out of my vision. Soon I, too, could hear music from the city and then what sounded like a geyser of laughter exploding from a fountain of joy. My traveling comrades went on to speak of Charis as the city of a certain king whom they described in fantastic language. But my ingrained skepticism welled up and overtook me again. How could they make such claims? For reasons I couldn’t grasp, I refused to let myself fall in with these people or be drawn to this city that enchanted them. I could not surrender control of my life’s journey or its destination. I was master of my fate and captain of my soul. Besides, I reminded myself, I knew of someone who could take me elsewhere, to a better place. I’d met Joshua on the morning I stumbled out of that cave, when I’d wandered in a daze, not knowing where I really was. I started running, and as I came into an oak grove, a man bounded in my direction. He was tall, muscular, and handsome, with a neatly trimmed copper beard. He wore sandals and an emerald toga, cinched at his slender waist with a braided red cord. Though his dress was like a statesman’s from another era, he somehow appeared modern and fashionable. “Welcome, Nick,” he called in a rich, clear voice, smiling broadly. I wanted to grill him with a dozen questions, starting with, “How do you know my name?” and “Where are we?” and “How did I get here?” But I didn’t want to reveal too much about myself and my ignorance. “Call me Joshua,” he said, extending his arm. I was struck by the strength of his grip. I couldn’t help staring into his eyes—morning-glory eyes, radiant blue windows of experience and knowledge and promise, deep-set eyes I could get lost in. He invited me to join a group of travelers he was with, but at the time I preferred to go farther on my own. Joshua put his arm around me. “Go if you must,” he said, then gave me a solemn look. “But be careful whom you trust.” This country, he explained, was beautiful but not always safe. Here was a man with inside information, and I wanted to know what he knew. Still, for some reason, I held back from asking him. As I turned to go on my way, Joshua smiled broadly and waved his great right arm, bronzed and powerful. “I’d be happy to serve as your guide,” he answered. He led me off the red road and down a series of roads that were gray—roads that promised me all the things I’d ever wanted. When we first set out, Joshua pointed ahead and told me, “Lead the way, my friend.” Though he was my guide, he showed me respect by walking to my side, a step behind me, giving me a sense of control. I liked that. I was in conquer mode, so we marched down the terrain at a fast clip. It was a plunging path at first, filled with sharp turns and lined with thornbushes that kept nipping at my pant legs. After an hour, we hadn’t reached a single rise in the trail. “Does this path only go down?” I asked. The path kept descending, and our pace kept accelerating. Finally, after dropping into a treacherous bog, we came to an intersecting path that rose upward toward firmer ground. Reaching the top of a slope and emerging from some trees, I came to a halt. Before me, positioned amid a half-dozen towering spires of rock, stood a glass and granite high-rise building. The sight of it was dreamlike yet so vivid, down to every detail. As I walked toward the structure, heart pounding, I stopped abruptly. This was the office building where I worked! I’d never seen it like this, isolated from the surrounding cityscape, as if it had been uprooted by some alien power and transported here. I entered the familiar ground-level front door with Joshua a step behind. We took the elevator to the twenty-fifth floor, and I instinctively walked through the maze of work stations toward my corner office. Joshua gazed approvingly at the view through the windows towering beside us. “You belong here, don’t you?” he asked me. I nodded. This was my world, and I had sailed its waters as expertly as any sea captain had ever commanded his ship and his men. Before I could answer, my attention was drawn to a photograph on the desk, a picture of my wife and two children. It had been taken three years earlier, when we still lived together. I hadn’t been able to get away from the office that day to make the appointment at the studio, but my wife told the photographer to take the picture anyway. “It’s more realistic with just the three of us,” she said to me later, twisting the knife. Joshua and I left the office. But after stepping off the elevator and out the front door, everything went out of focus—until I suddenly found myself with Joshua in my condo, listening to classical music. The absence of transition made me think I must be dreaming, yet I was completely lucid, and my blue recliner was as tangible as could be, right down to the little coffee stain on the right arm. For a few hours, I was immersed in a whirlpool of melancholy and reflection, going wherever the melodies led, over the mountains and valleys and through the deserts of my life. Especially the deserts. “The music’s beautiful, isn’t it?” Joshua said. For some reason I shook my head, believing there was something more I wanted, something no great thinker could lead me to. No sooner had I turned down this offer than we materialized back on a gray road. Before us stood more buildings rising up from the rocks and sagebrush. We entered a maze of mall interiors, where my eyes were drawn to displays of home theaters, power tools, antique guns, shiny knives, snow skis, camping gear, sports clothing. We looked over a balcony to see spotlights zooming over showroom floors filled with the latest-model cars and pickup trucks, boats and RVs, snowmobiles and motorcycles. Then the spotlights melted into marquee lights. Joshua and I walked into a fine restaurant filled with people in fine clothes drinking fine wines. My heart suddenly buoyed when I saw a woman alone at one of the tables, a woman who’d been part of the group of travelers I was with earlier. She looked so beautiful tonight, so slight and delicate, dressed so elegantly. I studied every inch of her. The longer I looked, the more she filled my heart. The woman seemed pleased to see me. We dined alone and toasted with champagne. When the music began, we danced. I felt intoxicated. She kissed me, then smiled and said she had to go. “Not tonight,” she whispered, but she smiled as she walked away, and her eyes said yes. 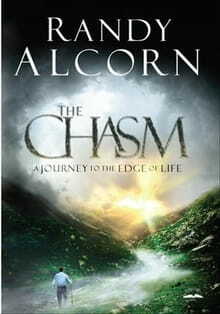 Excerpted from The Chasm by Randy Alcorn Copyright © 2011 by Randy Alcorn. Excerpted by permission of Multnomah Books, a division of Random House, Inc. All rights reserved. No part of this excerpt may be reproduced or reprinted without permission in writing from the publisher.